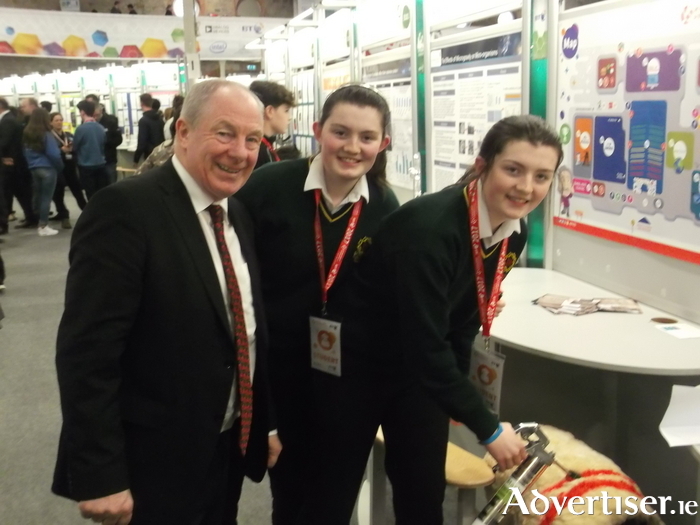 Michael Ring TD, Minister of State for Regional Economic Development, Sarah Murphy and Mary Murphy from Jesus and Mary Secondary School, Gortnor Abbey, Crossmolina at the BT Young Scientist and Technology Exhibition. Students from Jesus and Mary Secondary School in Gortnor Abbey picked up the third place award in the technology category of the BT Young Scientist and Technology Festival last weekend. Sarah Murphy and Mary Murphy picked up the bronze award for their 'Make a Mark - Sheep Marking Gun' project. Three other Mayo projects picked up highly commended awards, with St Muredach's College in Ballina picking up two of those with Peter Harrision and James Hackett's project 'Is concussion in early life a contributing factor to Parkinsons disease in later life' and a project by Aaron Hannon called 'EnableArm: The facial care device for people with limited hand dexterity' both being highly commended by the judges.